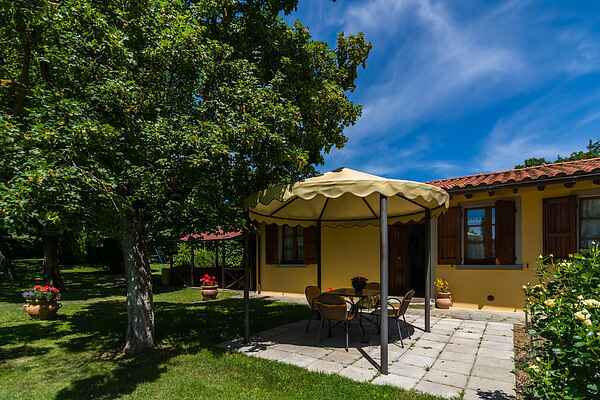 This cozy and beautiful agriturismo is in Castiglione Fiorentino in the rolling hills with forests, vineyards and olive trees. There are a total of three apartments overlooking a spacious garden. The decor is classic Tuscan terracotta floors and wooden ceilings and wooden beams. Each apartment has its own private terrace to enjoy and relax. There is a pizza oven and barbecue that guests can use. Ask the homeowner how you can make a pizza in the pizza oven! On request you can have breakfast or dinner. The home owner is an excellent cook so a Tuscan dinner at the agriturismo is a must. Natural products are used. The panoramic swimming pool is behind the apartments so the garden is quiet. The pool has a sun terrace with sun beds, umbrellas and a shower. There is also a part of the garden with play equipment for children. In the area you can walk and cycle. The agriturismo does organic farming and produces and sells wine, olive oil and vin santo. Further growing the agriturismo typical plants and shrubs. So if you want to buy a small olive tree and take it home as a souvenir, this is possible! Castiglione Fiorentino is a beautiful medieval town with a beautiful location and stunning views. Enjoy a fun city tour! Go to Agricola Buccelletti Winery where you can taste and buy wine. A place where people passionately work on quality products. Would you like a cocktail or a glass of beer? Go to bar Kriptonite in Castiglione Fiorentino (Corso Italia). A bar with music, cozy atmosphere and beautiful murals.